Preheat oven to 350 degrees. Cream butter and sugar, add eggs and remaining ingredients. Blend well and pour into 13x9 pan. Bake for 20-25 minutes. Spread over cooled brownies. For glaze, melt together 1 cup chocolate chips and 1 stick butter. Spread over mint layer. Chill and cut into squares. Has a recipe ever haunted you? In a good way, that is. 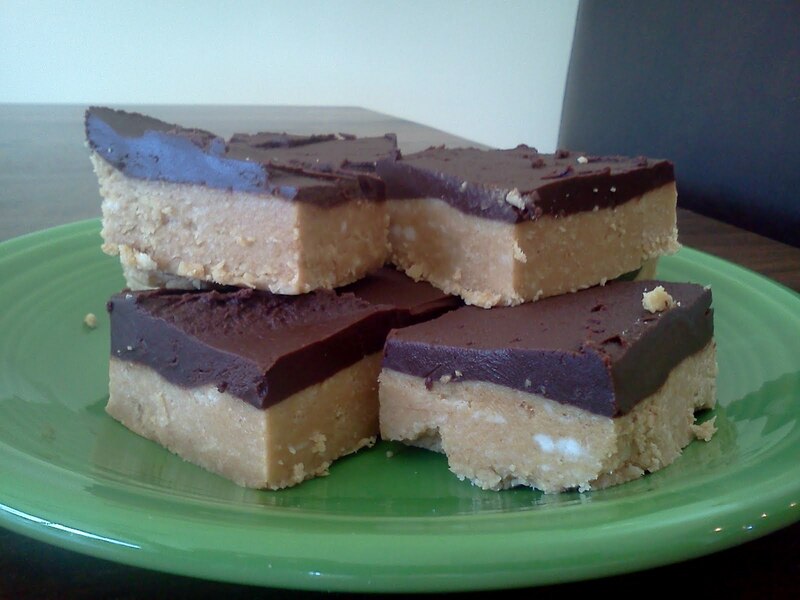 I fell in love with these peanut butter bars back in my grad school days. They sat, individually and very humbly wrapped in plastic wrap, right next to the register at my favorite bagel shop. Whenever I stopped in for my regular pizza bagel with broccoli, one of these always finished my meal. I never even knew what they were called, and it wasn't until I had graduated and moved away that I found myself longing for the recipe. The texture of these peanut butter bars, dense yet smooth, and the dance of peanut butter and chocolate flavors stuck with me for years. And one day, about 10 years later, I was flipping through one of my favorite cookbooks, and stumbled upon this recipe. A quick look at all the ingredients and I just knew, this had to be it. It is the combination of powdered sugar and graham cracker crumbs that give these bars that unforgettable texture. They are easy to make, don't need to be baked, and only require a spoon and a pair of clean hands for pressing the peanut mixture into the pan. If you've ever had buckeyes, these are similar in texture and taste, minus all the hard work of rolling the balls and hand dipping them in chocolate. (Courtesy of Cook and Love it More, compiled by all of the parents at Lovett, the school I attended in Atlanta from kindergarten through high school). Mix first four ingredients well and press into bottom of a 13x9 inch pan. Press mixture down firmly. Melt chocolate and 1/2 stick margarine together in saucepan, and pour over the firmly packed crust. Set aside until completely cool and then cut into squares. Poor Paula Deen. That's what I thought when I first heard about the scandal around her revelation that she has diabetes. I watch her show religiously, turn to her cookbooks often, and have a special place in my heart for her delicious accent and chubby cheeks. Maybe its because I hail from Georgia myself and her Southern drawl makes me feel like I'm home again. Maybe its because I know to make her recipes in moderation, and I know to balance them out with healthy foods and a fair amount of exercise. Or maybe its because all of her recipes taste so damn good! Not a single one of her recipes has ever failed me and she's made me look like a rockstar in the kitchen numerous times, and for that I'm forever grateful. Sure, as a public figure, she probably should have disclosed her condition earlier. Sure, she should probably talk a little more about moderation and throw in some healthier recipes as well. Sure, making money from some pharmaceutical company after all this, that's not so cool either. 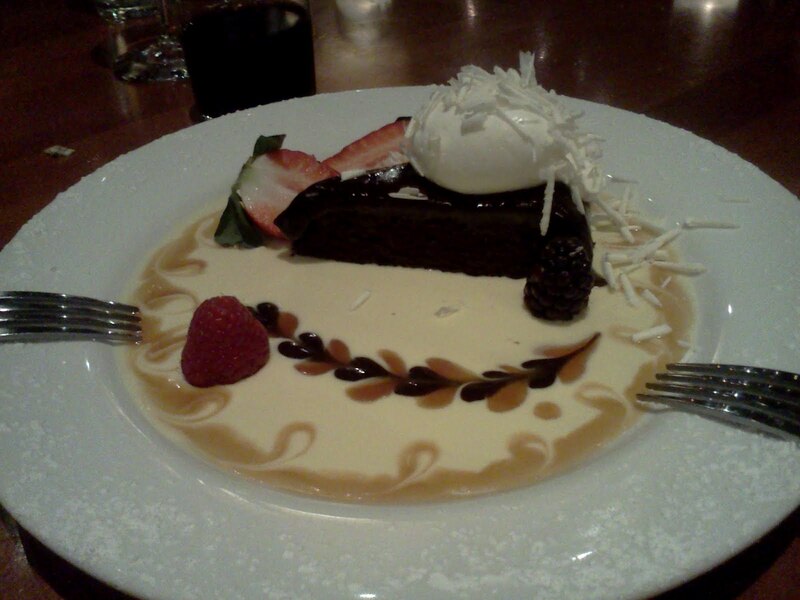 But, the Super Bowl was this week - a day of cold beer and good old American indulgence. 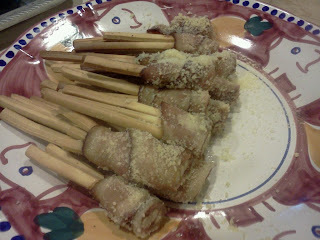 So, in her honor, I made Paula's Bacon Wrapped Breadsticks. I couldn't find the thick sesame breadsticks her recipe calls for, so I wrapped the bacon around a bundle of skinny ones and then ended up cutting them in half after they cooled, making them almost like little savory bacon lollipops. They were as divine as I could have imagined. Thanks, Paula, for another killer recipe. Now, I'm off to the gym! In this age of smart phones, we've all probably done it at some point. Taken a photo of our food, that is. I'm guilty of it, aren't you? Sure, when I'm writing a restaurant review, I often need to sneak a photo or two of my food. Yet other times, when I'm eating out purely for pleasure's sake, I find myself not wanting to photograph my food. See, I don't want to be like those other food bloggers that snap snots of everything they eat. I mean, I can't help but wonder... if I'm so busy trying to photograph my food, am I really enjoying it to the fullest? If I'm busy playing with my phone, can I really be appreciating my company? If I'm so consumed with where I'm going to post the photo of my dinner, and how to present myself in that post, doesn't that take away from the whole experience of going out? So, here are a few of the things I didn't photograph this week: the delicious blackberry cobbler I made (doing it just the way my mother used to), the perfectly simple, juicy cheeseburger I ate at Mel's Drive In in LA last weekend, and the loaf of apple bread I made with my son on Saturday. So, last night, when we went to dinner at Tutti's Off Main, I found myself resisting the urge to photograph my food. This was our first real date since the baby was born, so why would I waste even a second of it trying to document it. So, I didn't photograph the delicious tastes of an unusual Merlot the bartender offered us at the bar. I didn't photograph the doughy focaccia fresh out of the brick oven, or the broccoli soup smooth with the flavor of olive oil. I didn't photograph the mussels and clams in a garlic white wine sauce, or the quail stuffed with figs and prosciutto. I didn't take a picture of the pinot noir we enjoyed, or the potato torta on puff pastry. But when Chef Susan (I know her from my food tours) sent us a special dessert from the kitchen...it was too pretty and I couldn't resist snapping a quick photo. Isn't it a looker? If you could see me now, you'd see my head bent down in shame. I just looked at the date of my last blog posting...August 31st! That's five whole months of non-posts, perhaps a huge shot in the foot, the ultimate lame-0 move in the world of blogging (if you care about any of that). Since the purpose of having a blog is to actually blog, I really have no excuse. Sure, I started my own business, had a new baby, managed to somehow be awake and present for both Thanksgiving and Christmas, and get my kids out the door to school on time (lunchboxes packed, hair brushed, teeth brushed, and clothes on right side out - most days) thank you very much. It was my editor at the VC Reporter who pointed it out to me - why should they post a link to my blog if its really more of a non-blog, a sleeper, an antique blog with a thick coat of dust accumulating on it? There really isn't anything more annoying than going to someone's blog, only to find that they haven't posted in ages. I don't want to be that blogger. A few weeks back, I had the opportunity to review the Golden Chicken Inn in Oxnard for the VC Reporter. And what I found was that stepping into this restaurant, which has been around since 1929, is like stepping into another era. As you see here, this is a no frills kind of place...no white tablecloths or chandeliers, but instead, laminate tables and wood paneling galore. Behind the paneled walls in this photo are some of the 'private' dining nooks...unlike anything I've ever seen in a local restaurant. The register is stationed inside this unusual cage, but there's nothing menacing about it. The staff and servers at the Golden Chicken Inn are beyond smiley and friendly. This was our favorite dish of the evening - the kung pao chicken, filled with peanuts, scallions, chile peppers, and crunchy water chestnuts. The only downside? We liked it so much, there wasn't any to take home with our leftovers. The Golden Chicken Inn is located at 701 S. Oxnard Boulevard in Oxnard. Phone: (805) 483-9122. Note: they are closed on Mondays and Tuesdays. This was a first for me. Judging a contest that is. The venue: The Oxnard Salsa Festival. Our challenge: sample a gazillion salsas created by local chefs and discern a winner. We were charged with rating them by appearance, texture, consistency, flavor, seasoning, and heat level. It seemed like a pretty easy task - you know, eat chips and salsa and pick what I like, things I'm really good at. And then we got started. After tasting a few of the salsas I had that same panic I have sometimes when wine tasting (yes, I know, I shouldn't be taking my wine tasting so seriously that any level of panic is involved). "How will I keep them straight?!" "I like this one, but do I like it better than the one I tasted three salsas ago?" Luckily, sitting at my table, was a man named Vince. Boisterous, friendly, and clearly an aficionado of judging at the salsa festival, he took charge, metaphorically holding our hands and giving us some wise words of wisdom. He reassured us we'd know a favorite when we saw it, "A good salsa is so good that you'd want to sit down with a basket of chips and eat the whole bowl," he said. As we sampled, some were too spicy, some were too sweet, some had an off-putting look, and others a not so awesome texture. And then I met the mango salsa, some of the prettiest salsa I've ever seen: full of sunshiney chunks of mango with flecks of red and green pepper. It was sweet, yet had a subtle kick on the backside (that was the habanero talking), reminding you it was salsa and not a fruit salad. I loved it so much that after scoring all our salsas I had to move it to the other side of the table so I wouldn't eat the whole bowl. This was my winner, my favorite, and definitely the best thing I ate this week. Turns out, this habanero mango salsa is the baby of one of my favorite Oxnard chefs, Martin Ledesma, of Sugar Beets Restaurant and it went on to win Best Fruit Salsa and tied with Cabo Seafood Grill and Cantina's salsa for Judge's Choice. The Oxnard Salsa Festival takes place the weekend of July 30th....be sure to stop by and check out the salsa tasting tents and try the mango salsa for yourself. Be prepared, you may want to pull up a chair and eat the whole bowl.